The 2kg CO2 Fire Extinguisher is one of the best fire fighting products on the market for tackling fires involving electrical equipment as well as Class B fires involving elements such as diesel, petrol & oils. We would recommend a CO2 Fire Extinguisher to be used in almost all working environments where valuable electronics such as computers are being used. 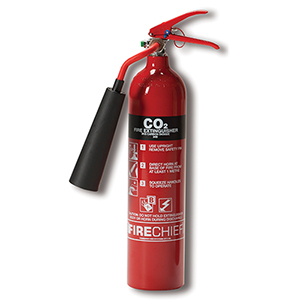 A carbon dioxide fire extinguisher is easy to operate and causes no mess to clean up after a fire. Constructed from aluminium, the FireChief CO2 fire extinguisher is light weight, ruggedly constructed and comes with a 5 year guarantee as standard. CO2 fire extinguishers are well matched with either a water / water additive or foam fire extinguisher in any office environment. They are versatile, light weight and totally harmless to electrical equipment. Protect yourself, your staff, your premises and your valuable electronics with a CO2 Fire Extinguisher. If an automatic gas suppression system or automatic extinguisher is not suitable for a server room, then a free standing CO2 fire extinguisher is the only real choice to protect these areas as they will not harm the equipment or cause a mess like a powder extinguisher would. When you need to service or refill an extinguisher, consider the price of a new one as it may work out cheaper to simply replace it. You are under no obligation to buy from your servicing company and will in almost all cases find the exact same fire extinguisher cheaper on our site. You may already have a CO2 fire extinguisher. Dig out the receipt and check the price. Just make sure you are sitting down when you compare the price to ours!! !